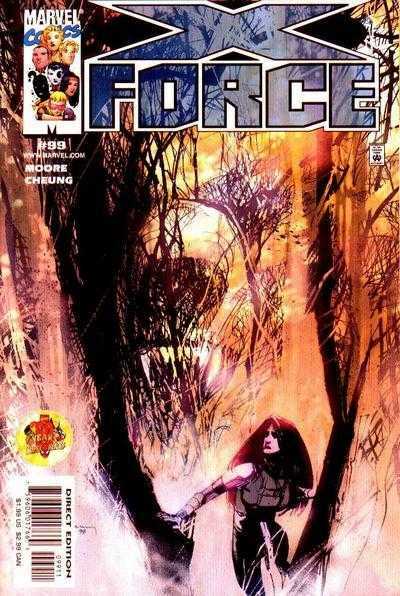 Summary: The Demon Bear attacks San Francisco, and X-Force soon learns that Arcadia is its target. She explains that the Bear has been stalking her since her last encounter with Moonstar. Soon, the Bear swallows both Arcadia and Moonstar. Inside the Bear, they see images of Moonstar’s horse Brightwind and Arcadia’s doll Mary Weather. The doll explains that the Demon Bear was created when Arcadia absorbed Moonstar’s memories. They must combine their reality-warping powers to unmake it. After following the doll’s instructions, the Demon Bear disappears. In the smoke, four versions of Moonstar emerge. Siryn is visiting her “aunt” (actually her mother’s cousin, according to the narrative captions) Victoria Donnely in Looking Glass, California. In an antique shop, an elderly woman puts a necklace around Siryn’s neck and it begins to glow. Sunspot, meanwhile, is adjusting to life in the Hellfire Club. The story hints that his first love Juliana, recently resurrected by Selene, might actually have memories of him. Risque makes a sudden appearance during the Demon Bear fight to aid Proudstar. Later, armed SHIELD agents arrive and target the Bear. It reads as if both of these appearances are creations of Moonstar/Arcadia’s reality warping powers, but the next issue confirms that they're really there. Review: It’s John Francis Moore’s penultimate issue, and true to form, it’s crammed with subplots, narrative captions, and New Mutants references. Evoking the Claremont/Sienkiewicz “Demon Bear Saga” is a dangerous move given its canonization over the years, but after months of teasing, Moore makes it clear that he’s not honestly trying to write a sequel to the original story. Instead, it was just a tease, setting up the final stage of the Moonstar/Arcadia story. Arcadia is of course tied in with the prolonged Deviants storyline that’s become something of a drag on the book, but Moore does a decent job this issue of making Arcadia interesting in her own right. The flashbacks to her childhood (memories Moonstar now shares) are pretty effective in fleshing her out, and Cheung gets some mileage out of Arcadia’s living Raggedy Anne doll that conveniently tells the heroes what they need to do. However, I have to say that the subplots seem more intriguing than the main story. And with only one issue left, it’s hard to imagine that they’re going to be properly addressed before Moore’s departure. Summary: Cordelia Frost is stalked in the woods outside the school. Eventually, she crashes through a window, leading Gen X to investigate outside. They’re soon ambushed by Mondo. Banshee’s sonic scream knocks him unconscious, but he’s shocked by the sudden arrival of Black Tom and Juggernaut. Meanwhile in the Alps, one of M’s classmates is attacked by a vampire. Numerous brief subplot scenes in this issue: Penance runs off, apparently in anger, after watching the team wrap Christmas presents. A mystery figure leaves a folder on Emma’s desk, detailing the members of the New Hellions. Banshee confides to Tom Corsi that he doesn’t understand Siryn’s behavior following her injury. Mondo (or more accurately, his clone) was apparently killed by Bastion in Generation X #25. Chamber implies that his rich, out-of-touch parents probably don’t even know it’s Christmas. I believe this is the first reference ever made to Chamber’s parents. Skin reminds the reader that his mother believes he’s dead, and reveals that his father vanished years earlier. Penance makes an ice sculpture of what appears to be Gateway, although Jubilee doesn’t recognize who it’s supposed to be. Review: Jay Faerber begins his final arc on the book, and has apparently decided to use this time to placate the fans that kept asking for Mondo’s return. Mondo has a strange place in Generation X history. He debuted in the Generation X preview special along with the rest of the team, the implication being that he would join in the early issues of the book. The fans kept waiting, but would only receive sporadic subplot pages that had Mondo lounging on the beach with a brunette beauty. In the ensuing months, “Age of Apocalypse” consumed the X-line, bringing us an alternate reality that prominently featured Mondo as a member of the team. But no Mondo when everything returned to normal. He even showed up as a member in that FOX made-for-TV movie, but couldn’t be found in the comics. I suppose there’s nothing inherently wrong with using Mondo again. He was never truly fleshed out in the mainstream Marvel continuity, and his powers are more interesting than most of the energy blasters and telepaths that are usually pitted against the X-teams. Tying Mondo to Black Tom, who was present for his big moment in issue #25, uses past continuity well. (Faerber is definitely using continuity to his advantage on this book. Picking up on the New Hellions from X-Force and giving Emma time to respond to them is another smart move.) 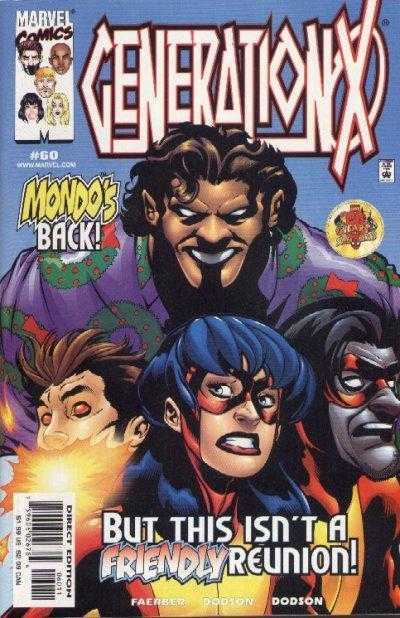 Unfortunately, Mondo’s visuals are unique to Chris Bachalo’s style, so the readers who wanted more of the Mondo they got in AoA’s Generation Next are likely to be disappointed. Also, the identity of Cordelia’s attacker is kept secret until the end of the issue, but of course it’s been horribly spoiled by the cover. As a setup for the next issue’s resolution, this is fine, although I think the pace is a little leisurely given that Faerber only has a few issues left to finish his run. Summary: Jake and Sophia, a mutant/human couple in Genosha, face bigotry. Magneto unexpectedly enters and defends their love, causing the citizens to change their mind. 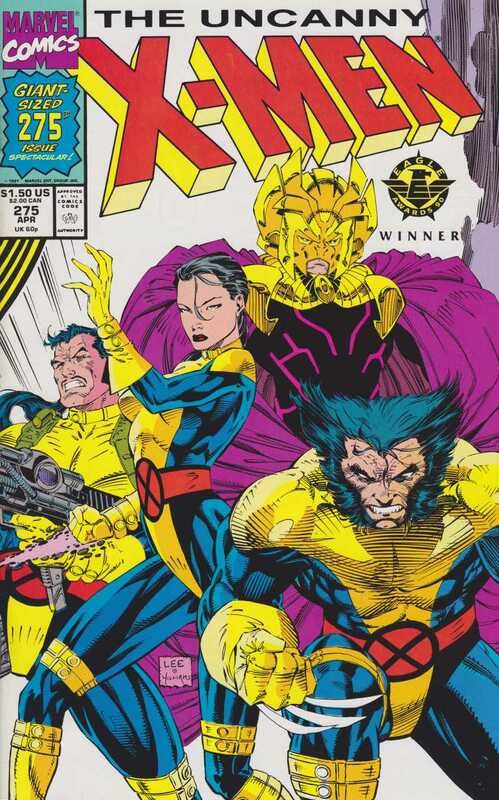 Meanwhile, Wolverine, Archangel, Nightcrawler, Shadowcat, and Jubilee receive a distress signal from Genosha while on their way to Egypt. They land and meet Madrox, who called for help after Magneto kidnapped Forge. Wolverine frees Forge from captivity and buys him the time he needs to reverse the effects of the mind-control device that’s forcing Genosha into tranquility. As the X-Men battle Magneto, he drops the charade and reveals himself as Exodus. Exodus claims that he’s renounced all prejudice and merely wanted to bring peace to Genosha. When the public’s free will returns, Jake and Sophia are targeted again and murdered. This group of X-Men is flying to Egypt to face Apocalypse, following the events of Wolverine #147. According to Madrox, Xavier sent him and Forge to work undercover in Genosha after Magneto was granted authority by the UN. The High Evolutionary makes a cameo at the end, observing the murders of Jake and Sophia. He blames the aberration of mutants for the conflict, setting up his role in the next mini-event for the X-titles. I Love the '90s: Jubilee blesses us with a “What’s the dillie-o?” and one bizarre reference to Homey the Clown. Review: Overlooking the cover, which is one of the most egregious cover spoilers I’ve ever seen, this annual serves as a nice example of how to write a story that fits within the edges of continuity without coming across as filler. In fact, it’s hard to think of a Magneto-era Genosha story that’s any better than this one. Ben Raab could be an inconsistent writer during this period, but the ropey plotting and corny dialogue that often dragged Excalibur down can barely be found here. Anthony Williams also produces much stronger work than was evident in his numerous fill-ins during the late ‘90s, leading me to believe he wasn’t given a last minute deadline to deal with this time. Rather than presenting Genosha as the island of horrible mutant oppression, Raab explores the idea that the formerly oppressed mutants could be just as prejudiced as the humans. There’s no peace in Genosha because neither group can trust the another, creating an interesting hook for the story. How would Magneto react to a human/mutant romance? Is he so far gone at this point that he’s going to prevent humans from touching precious mutants, or would he make a real stand for equality? The truth is, the story doesn’t give us an answer, because Magneto doesn’t appear. (Presumably because Apocalypse has already kidnapped him for the main crossover.) Instead, a disguised Exodus takes his place, and decides to abuse his telepathic powers and simply force everyone to get along. Madrox is allowed to briefly present the counter argument, essentially saying that this might be what it takes to have peace in Genosha, but of course he’s quickly rebuffed by Forge. The heroes do the right thing and restore the public’s free will, which inevitably ends in the death of two innocent people. A depressing ending, of course, but it works as a reminder of what a nightmare Genosha is supposed to be. Compare this to say, Magneto Rex, and it’s easy to see how poorly the status quo was usually handled. Summary: Batman encounters Rosemary, a woman who’s illegally traveled to America to retrieve the infant she sold earlier in Central America. 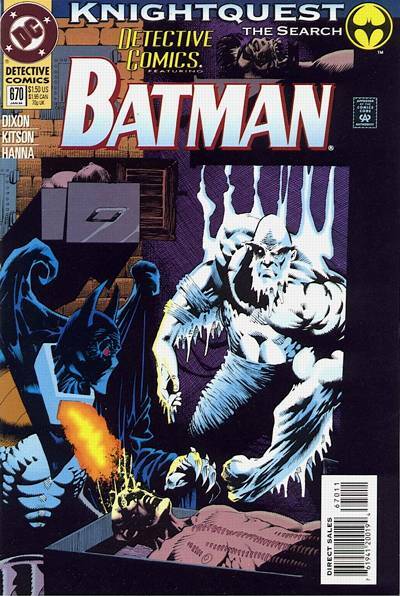 Batman researches the case and finds a connection to the Rayo Fertility Clinic. While staking out Dr. Rayo’s home, Batman discovers a van delivering babies. He forces the van to crash and rescues the children inside. 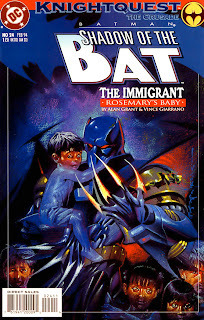 Rosemary’s child is retrieved, and Batman pauses for a moment to reflect on his own mother before resuming his crusade. Irrelevant Continuity: “The System” allows Jean-Paul to instantly speak Spanish. Review: I have to question why any of these Shadow of the Bat issues are included when there are numerous stories that affect the major storyline that are left out of the book. As a psychological study of Jean-Paul, there’s a solid premise here, but I don’t think anyone would tell you that it’s required reading for this era. Grant’s constructed a story that touches on Jean-Paul’s knack (and distaste) for detective work, requires him to reflect on his mother (or who he thinks she might’ve been, since he can’t remember her), and forces him to deal with a domestic situation that requires more than punching and kicking. Hypothetically, this should open the door to a real examination of the character. Unfortunately, the entire issue is marred by Batman’s decision to attack a van filled with babies. He literally runs the thing off the road, then acts shocked that the infants might be in danger. What kind of a moron is this? This scene, combined with Vince Giarrano’s nasty early ‘90s art, makes the issue pretty unbearable. Summary: The firing squad lined up against Batman realizes the Joker has only provided them with blanks. Batman uses the confusion to escape and rescue Cindy. She reveals that she’s an actress who was in on the scheme all along, but never expected to be placed in actual danger. Disillusioned, Batman chases down the Joker and brutalizes him. The police arrive and prevent Batman from killing Joker. After the Joker is taken to an ambulance, he manages to escape while strapped to a gurney. Irrelevant Continuity: During a subplot scene featuring Commissioner Gordon and his wife, Gordon is once again adamant that the current Batman is the original. Batman has already established that Gordon has actually come to the opposite conclusion. The Joker, meanwhile, quickly realizes that this is not the original Batman while watching him fight his flunkies. Review: I don’t dislike all of Kelly Jones’ covers, but I find some of them just galling. This has got to be the worst one I’ve seen so far. It’s certainly a poor comparison to Graham Nolan’s interior art, which is very well constructed and easy on the eyes. His layouts are also strong for most of the issue. The page depicting the Joker’s realization that he’s watching an imposter Batman, featuring a tiny circular insert of the Joker at the bottom of each panel as the “camera” moves tighter and tighter, is fantastic. As the first meeting between the new Batman and the Joker, this arc works fairly well. I question if it really needed to last three issues, though. 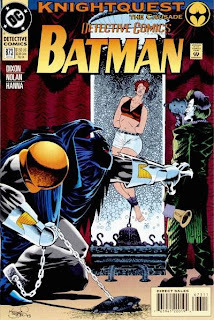 The two plot twists this issue (that the Joker doesn’t want any of his goons to kill Batman, and the revelation that Cindy’s an actress) probably could’ve been covered in the last chapter. Regardless, both of the plot points are used effectively. I’m assuming it’s already canon at this point that the Joker doesn’t really want to kill Batman because he loves their game too much, so playing on that idea and showing how Joker responds to a replacement Batman is a nice angle to explore. And while it’s not a shock to learn Cindy’s an actress, the revelation is a smart way to advance Jean-Paul’s growing cynicism about the citizens of Gotham. 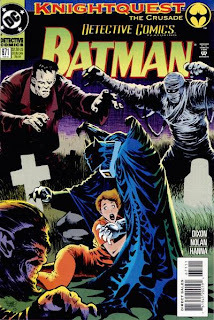 One of the better concepts behind “Knightfall” is the emphasis on why Jean-Paul is such a terrible replacement -- not merely because he’s generically comic book crazy, but because he lacks any of Bruce Wayne’s humanity or concern for his city. Summary: Batman rescues Cindy, who the Joker has disguised as Robin. When he later checks on her in the hospital, he discovers she was discharged to the care of an “Allen Smithee.” The Joker sends a false clue to the police and media, leading them to the Monarch Theatre. Batman, meanwhile, investigates an old silent movie studio and finds himself caught in a series of traps based on old movies. He’s drugged and chained to the wall, feet away from Cindy, who’s trapped inside a water tank. The Joker is nearby, dressed in an homage to Casablanca. “Huh?” Moment: Batman, who’s wearing armor and a full face mask, is somehow drugged by getting hit in the face with pies. Review: More parody, as the Joker complains about Batman ruining his three-act structure, before setting up a series of death traps based on old movies. Dixon even throws in a reference to the old film pseudonym “Alan (or Allen) Smithee” during Batman’s pursuit, which was not a well-known fact at the time, so I’m assuming he’s writing this out of a genuine love for old movies. And it’s entertaining, but not very deep. There’s a nice scene that has the new Batman reflecting on why his predecessor obsessed so much over the Joker and cursing himself now for dismissing him earlier, but other than that, the issue covers the same ground as the previous one. Summary: The Joker convinces studio head Barry Zedmore to finance his film, "The Death of Batman." Joker sets up a confrontation at the city college, where men in movie monster masks menace student Cindy Brookes. Batman saves her, and soon finds himself infatuated with Cindy. He returns to the college to investigate and finds himself in another trap. He races to Cindy’s dorm room, only to discover Robin’s body being thrown out of the window. I Love the ‘90s: Cindy has a Fabio poster in her room. Joker is also using doppelgangers for Siskel and Ebert as his advisers on the film. “Huh?” Moment: Barry Zedmore complains to one of his producers that it’s 4:00 AM in LA when he’s on the phone. That makes it 7:00 AM on the east coast. In the very next panel, Joker tells Zedmore and his producers (who are being kept in a cage), that they need their rest for tomorrow’s early shoot. So they’re going to sleep for 24 hours? Review: This marks the beginning of the “Joker Makes a Movie” storyline Dixon has been teasing for months. Largely a parody of Hollywood, it’s obviously a bit silly, but also a welcome break from the general bleakness of most AzBats stories. Oddly enough, the Joker’s nom de plume while making the film is Joseph Kerr, which actually is the name of an animation writer. One that has even written Batman episodes featuring the Joker. It’s also a bit strange to see Graham Nolan’s interpretation of studio head Barry Zedmore, because he looks a lot like Joel Schumacher, even though I’m not sure if Schumacher was even announced for Batman Forever by this point. Both Dixon and Moench have apparently decided this month to explore Jean-Paul’s budding sensuality, although Dixon is much more subdued than Moench. In this story, Jean-Paul is merely developing a crush on a co-ed and engaging in slightly inoffensive stalking. In Batman, Jean-Paul is driven into hormonal overdrive merely by meeting Catwoman for the first time. (The implication being that he needed a change of the Batsheets.) I think Moench got more mileage out of the concept, although in fairness, Jean-Paul’s discovery of women in just one aspect of Dixon’s story. The bulk of the issue is spent mocking Hollywood, and right down to the Joker’s ponytail, it’s pretty amusing. One advantage of the multi-title, shared continuity format is that one title can go a little crazy for a few months while the other books carry on the “important” storylines. Summary: Catwoman escapes from the police, leaving behind the Benzotrilene. Before leaving, she also tells them where to find the stolen Xyklon-C. Later, Professor Underhill is kidnapped by rogue Alliance members Marv and Doogie. Catwoman summons Batman with the Batsignal and convinces him to help her find Underhill. They rescue Underhill, but not before Doogie makes his way to the trade conference. The gas he creates, however, is harmless tear gas, because Underhill gave him the wrong formula. Catwoman exits on a helicopter, warning the businessmen to follow a stricter set of ethics. 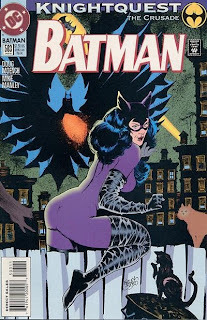 Production Note: I would be curious to know the release schedule of this Catwoman/Batman crossover. Since Batman has the two chapters in the middle, was the crossover released in the proper order, or did it go Catwoman-Batman-Catwoman-Batman? Review: I can’t believe this crossover was stretched out over four issues. I can understand why the first meeting between the new Batman and Catwoman would be viewed as a big deal, but four chapters about rogue environmentalists, stolen canisters, and a trade conference with literally faceless industrialists is just tedious. Given that all of the Catwoman supporting cast members disappear during the Batman chapters, and that one of the Batman chapters was an issue-long fight scene, I can only guess that Doug Moench wasn’t even fully aware of what this crossover was supposed to be. The structure goes: 1) introduce convoluted plot device, 2) have Batman meet Catwoman, 3) Batman fights Catwoman, 4) Batman and Catwoman team up, more with the plot device, story finished. It’s kind of a mess, although I still think the second chapter is fun. 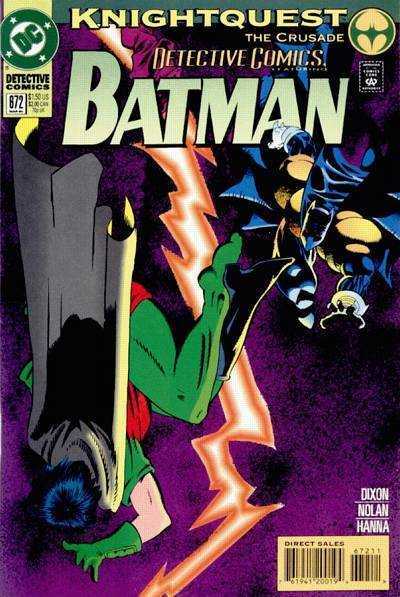 I could easily live with only the Batman chapters being reprinted in this book, given what had to be left out. Summary: Batman pursues Catwoman, and finds himself unable to defeat her. Meanwhile, the police are notified of their fight and race to the Tuscany Building. Batman and Catwoman fight to a stalemate. When the SWAT team enters, Batman points to the canister, which he believes to be Xyklon-C, on the floor. He implicates Catwoman in the robbery and leaves. Review: This is an extended fight/chase scene between Batman and Catwoman, and really...that’s it. Jean-Paul’s internal conflict isn’t as engaging as it was in the previous issue, and there’s nothing added here that the last chapter didn’t cover. The action looks great, though, and Moench tries to liven the story up with explosions, colossal Sprang-esque props, and a giant gargoyle statue crashing through a police car. As one chapter in the trade, it’s fine, but it’s an unusually thin plot for a Batman comic of this era. Summary: Batman spends the night consumed by thoughts of Catwoman. The next day, Commissioner Gordon asks him to protect the trade summit from terrorists. Batman suspects Catwoman is involved, following her previous robbery of the chemical warehouse. He tracks her down and, to his surprise, finds her to be his physical match. She exits the fight, after stealing Benzotrilene, a harmless chemical than could double for the deadly Xyklon-C. Batman vows to stop her. I Love the ‘90s: The story makes a few references to the 1993 terrorist attack on the World Trade Center. Later, we’ll see that the trade summit is happening at the Gotham equivalent of the Twin Towers. Review: I have to admit that Doug Moench gets a lot more out of Jean-Paul’s first meeting with Catwoman than I would’ve expected. It’s obvious that Jean-Paul’s “programming” is intended to have some thematic links to Christian doctrine, although the creators have been careful to avoid any overt religious bashing. 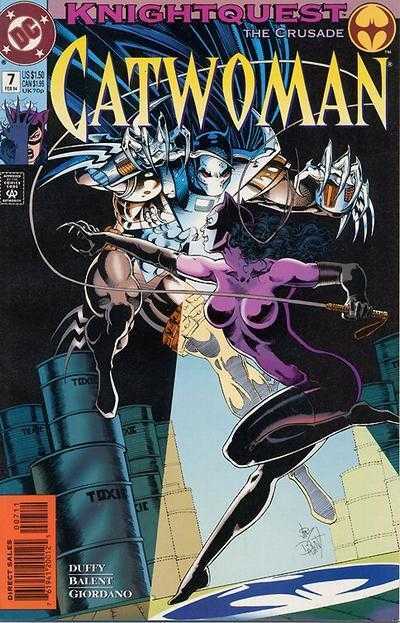 This issue explores Jean-Paul’s repressed sexuality, which is absolutely enflamed after his first meeting with Catwoman. Apparently unaware of how to deal with “those” kind of feelings, Jean-Paul finds himself reverting to the type of twelve-year-old who's obsessed with, say, Jim Balent’s Catwoman. “I did dream about her…all the way to darkness. And the dreams were…shameful.” And this isn’t the first double-entendre. The story’s filled with them: “Maybe I’ve fallen, and fallen hard…but she still goes down.” Batman’s also going to “penetrate her mystery” and “make the cat howl.” I love the idea that Jean-Paul isn’t even consciously aware he’s doing this; anyone somehow unaware of the sexual connotation of these terms would take this as typical Batman dialogue. And, oddly enough, this does work in humanizing Jean-Paul a bit. He’s not so far gone that he can’t develop a crush, which makes him more interesting as a lead. Summary: Members of the Friends of the Earth Nature Magic Alliance contact Catwoman, warning her that industrialists are scheming to use the new neurotoxin Xyklon-C to kill animals in the rainforest, thus opening the area for development. She also discovers that one of the Alliance’s members, Professor Underhill, inadvertently created the toxin. 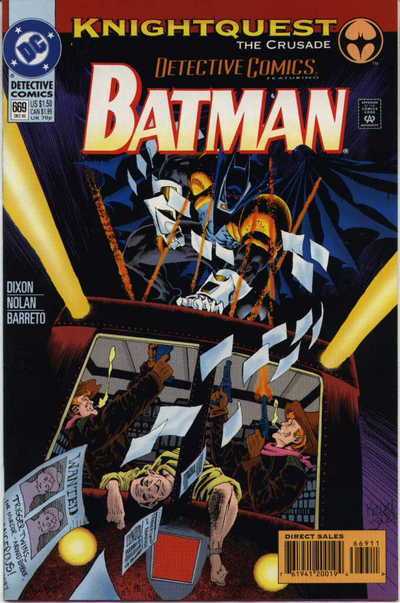 Underhill is targeted by kidnappers, but is rescued by Batman. When Underhill returns to the group, he explains that Xyklon-C is inert until it’s mixed with Atrophane. Two rogue Alliance members, Marv and Doogie, steal Underhill’s notes and leave to find a supply of Atrophane. 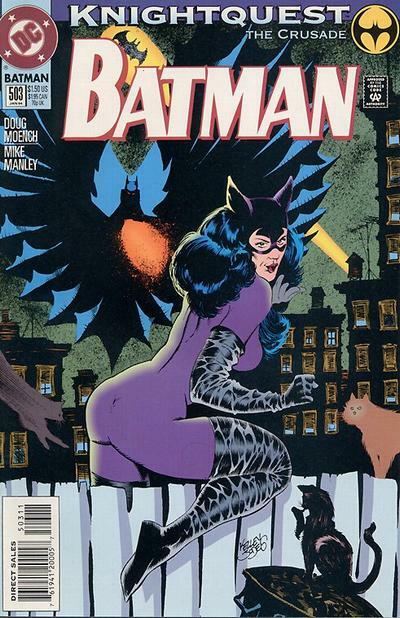 Catwoman attempts to head them off by robbing a chemical warehouse, unaware Batman is watching her. Irrelevant Continuity: I don’t know if this was the regular status quo for the title, but in this story, Catwoman treats Selina Kyle as a fabricated public persona, putting on a blonde wig and pretending to be a ditzy clutz. She’s also a “part time” member of the Friends of the Earth Nature Magic Alliance. 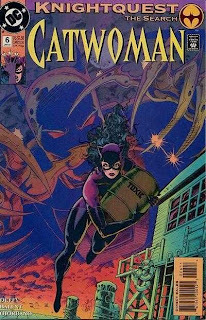 Review: The early ‘90s Catwoman series is probably best remembered as the most flagrant example of mainstream cheesecake during the era. Even Wizard magazine had to comment on the outright insanity of Jim Balent’s anatomy (of course they still put his rendition of Catwoman on the cover, and made sure to reproduce as many of his drawings as possible in each issue). I don’t recall anyone ever discussing the actual storylines, any attention the book received was more along the lines of “Can you believe DC is publishing this?” And not necessarily asked with outrage; a teenage boy probably followed that question with a high-five. 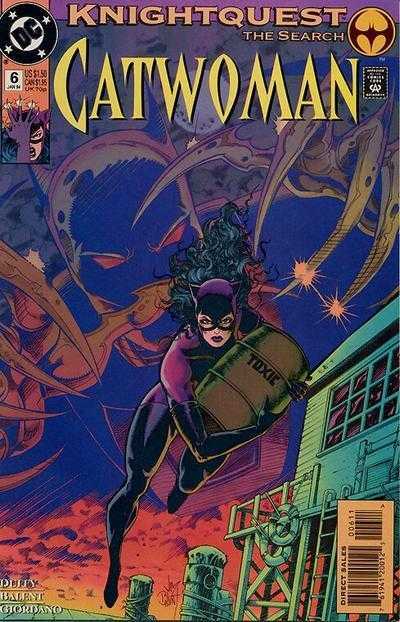 So, was Catwoman any good? I only have a few issues to judge the series on, but they don’t give me a lot of hope. Someone in the early ‘90s thought it would be a good idea to remake Catwoman as an animal rights activist (remember her early appearances in the cartoon? ), which I guess Jo Duffy has taken to the next level by having her associate with an eco-terrorist group. The “Friends of the Earth Nature Magic Alliance” just sounds like a parody, and based on the physical appearance of several members, I can only assume that’s what Duffy is going for. An affectionate parody, since Duffy certainly seems to be siding with the group. Yet, she also has Catwoman point out that several of them have a bloodlust that rivals the industrialists they’re fighting. (The story doesn’t draw attention to this, but it’s also obvious that the group is more concerned with the rainforest animals that will be killed by the gas than the indigenous people.) By the story’s end, we see two of the goofiest members steal the gas so that they can use it against the comically evil businessmen who created it. Marv and Doogie are such ridiculous characters, it’s hard to believe that their actions are going to be the inciting incident for this Batman crossover, but here we are. All of the talk regarding the neurotoxin, and there’s a lot of it, mainly serves as a setup for getting Catwoman to steal something while maintaining a pure motive. I don’t know if the series had to do this often, but it seems like a lot of energy is wasted on finding reasons for Catwoman to steal things. 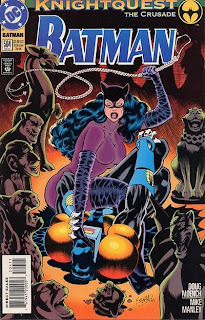 I’m assuming this had to be done because Catwoman was at least somewhat reformed by this point, but that doesn’t make the lengthy setup any less boring. And all of the Captain Planet material feels out of place in a Catwoman story anyway. Couldn’t she just steal from other criminals? Summary: Detective Montoya is left to guard a frozen body that’s been taken to the morgue. The body unexpectedly comes to life, pursuing her and the coroner, Colleen. Batman overhears the gunshots nearby and enters the morgue. They soon discover the body is Mr. Freeze, who is hiding in one of the refrigerated rooms. Batman defeats him, but has to be stopped by Montoya before killing Mr. Freeze. I believe this is the first time Renee Montoya appears as a detective, unless her promotion occurred in a story not reprinted in the Knightfall trades. Mr. Freeze was apparently left a frozen slab after a confrontation with the Joker. I believe this is a reference to one of the original Robin miniseries. Review: The attempt to make Jean-Paul slightly more likable last issue is walked back, as he stands idly by and lets a couple get mugged while Christmas shopping. They needed to be taught a lesson about “the jungle,” you see. This does work, as a quick scene meant to establish just how cold and un-heroic Jean-Paul can be, I just wonder if everyone was on the same page regarding how Jean-Paul should act, of if he’s intentionally written as erratic. Anyway, this issue is essentially a horror story, using Mr. Freeze as a stand-in for Alien. It’s a decent change of pace from most of the recent issues, although I don’t think Barry Kitson’s art lends itself to horror. Mr. Freeze is also a dull villain at this stage, as his animated series revamp has yet to make its way into the comics. Summary: The Trigger Twins hijack the Gotham subway system’s “money train.” They’re pursued by Batman, who’s riding his new subway car nearby. After Batman subdues the twins, their boss, Dirty Dan, is apprehended by police. Meanwhile, Hollywood producer Calvin Berkowitz meets with the Joker. I Love the ‘90s: There’s no reference to the movie Money Train in this issue, for good reason. This comic predates the movie by over a year. Review: The creators seem to be having fun with this modern day train robbery story, and the classic western vibe they’re trying to evoke is helped a lot by Eduardo Barreto’s inks. If you’re not interested in the minutia of old pistols or subway systems, however, the story feels a bit thin. It does seem as if Dixon is trying to humanize Jean-Paul a bit, as he reveals for the first time that he’s pushed Robin away for his own safety, and he even cracks a few small jokes during his fight with the Trigger Twins, but he remains a dull protagonist. Writing Jean-Paul does put the creators in an odd position; he’s supposed to be on some level a parody, but the writers are stuck using him as the central character in every issue they’re writing for several months. If played as a joke, that gets old fast, and played too straight, he’s just too one-note to carry a story. Summary: The Starjammers arrive and rescue the X-Men from Deathbird and the Imperial Guard. Meanwhile, in the Savage Land, Colonel Semyanov ambushes Magneto. Semyanov then abandons Nick Fury’s UN command and joins Zaladane. Rogue, Nick Fury, and Ka-Zar make their way to Zaladane’s citadel, where she is stealing Magneto’s powers. They interrupt the process, allowing Magneto to use Brainchild’s equipment and regain his powers. Magneto kills Semyanov, and even against Rogue’s pleas, kills Zaladane. He abandons his former allies, determined that kinder methods will not save mutants. Later, after Lilandra is restored to the Shi’ar throne, Psylocke is attacked by a mysterious figure, while Jubilee and Gambit accidentally catch Xavier torturing the imprisoned Imperial Guard. Colonel Semyanov is the father of the Russian sailor slain by Magneto years earlier (Uncanny X-Men #150). He reveals this issue that the Russian members of the UN team were always assigned to kill Magneto. Ka-Zar remarks that dinosaurs in the Savage Land are evolving faster than ever and becoming too smart, following the High Evolutionary’s restoration of the area. I don’t believe this plotline was ever expanded upon. Banshee wonders why Gambit always asks questions of the other X-Men, but reveals nothing about himself; another hint that he’s a spy. During a montage of tragic moments from Magneto’s past, one of them includes him fighting the Shadow King. This is the first time Magneto’s ever been connected to Shadow King. Later, while listing all of the current threats to mutantkind, Magneto names “the Hellfire Club and their accursed Shadow King.” When the Shadow King storyline is finally resolved, at the end of Claremont’s run, the Hellfire Club are nowhere to be found. Apparently, Claremont was developing a Magneto/Hellfire Club/Shadow King storyline, but this issue is the only evidence I have to support the theory. Rogue’s powers conveniently return while fighting Zaladane and the Savage Land Mutates. She tells Magneto that his process did work, he just should have been more patient. Gimmicks: This barely counts as a “gimmick,” but this issue marks Uncanny X-Men’s first gatefold cover. There are no enhancements on the cover, though, and the additional fifty cents added to the standard cover price are for sixteen extra pages. Review: Speaking as someone who bought this issue as a kid, this really did feel like an event. I can’t think of any other double-sized anniversary issue I own that feels like it truly merits the hoopla associated with reaching a multiple of 25. I was also young enough at the time to at least briefly consider if the cliffhanger ending of the story was true; could Xavier be a villain? I dismissed the idea after I considered that the character had existed since the early ‘60s, and couldn’t imagine Marvel radically altering an established hero’s personality like that. (How little did I know…) In retrospect, the storylines it’s resolving haven’t been around for too long, and there’s still the massive Shadow King subplot simmering in the background that needs to be addressed, but reading the issue today it still feels as if it’s worthy of the extra pages. Probably the most remarkable element of the story is Claremont’s ability to give every member of the cast something to do. That doesn’t mean that every Starjammer or Imperial Guard member gets the spotlight (and poor Lila Cheney is left without a single line of dialogue), but the actual X-Men all have at least one moment to shine. Even if it’s a brief moment of Storm questioning why Deathbird’s plan made no sense, it’s significant because we’ll find out next issue why Deathbird abducted the team, and it exposes the true villain of the piece. It’s just a quick dialogue exchange, but it establishes how sharp Storm is, and foreshadows upcoming events in the story. And Storm’s the X-Man who receives the smallest amount of attention in the issue. Every X-Man aids the story in some way, or is given some moment to express an aspect of their personality. Compare Forge’s awed wonder at experiencing an alien culture for the first time to Jubilee’s annoyance at the way these things look (and smell), for instance. Now, think about how rarely any X-Men story post-Claremont utilized the cast so well. And it's hard to imagine any writer matching Claremont's work with Magneto during this arc. Magneto's monologues during this storyline are absolutely haunting, as Claremont fulfills Magneto's journey from villain to failed hero to...who could even say? A damaged man who isn't willing to play the old games any more, but is too powerful and iconic to ever truly abandon his past. Jim Lee’s art also serves the story extremely well. There’s a fair number of splash pages and double-page spreads, but Lee is just as skilled at using multiple panels to tell the story. Zaladane’s death scene is twelve panels, for instance, all one page. It doesn’t feel cramped at all, and in fact serves to heighten the tension between Rogue and Magneto during the scene. Lee’s penchant for hyper-detailed characters is also put to use, as we see just how alien, or outright gross, characters like the Starjammers or Savage Land Mutates could be. I remember being shocked at Lee’s ability to take an innocuous looking character like Worm and make him look outright disgusting in this issue. Lee could actually be as good at monsters as McFarlane, but apparently he’s never let go of this Gulf War-era military design work. It’s what he always seems to go back to, but he could embrace horror just as easily. Summary: Hiro reaches out to Opal, explaining the details of her parents' secret love affair. She still refuses to marry Hiro, however, leading Tatsu’o to declare that he’ll choose her mate. Iceman soon arrives with Mariko and her ninja guard. They’re met by Tatsu’o’s daughter, Shizu’ko, who reveals that she’s poisoned Tatsu’o’s tea in order to spare Opal. Shizu’ko and the ninjas rescue Opal, while Hiro duels with Iceman. Iceman agrees to fight without his powers after Hiro questions his honor, but Opal shouts that Hiro’s powers are built into his body, making him as superhuman as a mutant. Hiro realizes she’s right and stops the duel. Iceman escapes with Opal, as Tatsu’o’s compound burns. Hiro reveals that Opal’s father died while serving in her grandfather’s criminal empire. Later, one of the Cyberpunks speculates that Tatsu’o favors Hiro because he looks like his deceased son. The term “Cyberpunk” actually doesn’t appear in this issue, even though it was the established name of Tatsu’o’s guard last issue. 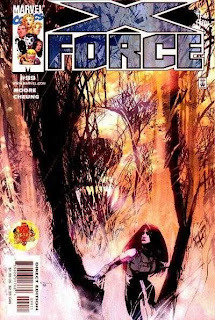 This issue, they’re called “Cyber-Warriors” by Shizu’ko, and even “Cyber-Force” (!) by one of the members. Review: I can’t imagine Louise Simonson wanted this to be her final storyline, but after five years, this issue marks her departure. Rob Liefeld, with Fabian Nicieza as scripter, has already replaced her on New Mutants, and beginning next issue, Chris Claremont will script X-Factor over Jim Lee’s plots. This marks one of the few times in X-Factor’s run that it will share a writer (or writers) with Uncanny X-Men. Considering that Simonson has spent the last five issues on this title either participating in a crossover or co-plotting a story with the new artist, I couldn’t blame her if she left out of simple frustration. Anyone curious to see where Simonson would’ve taken X-Factor without editorial interference might be interested in the X-Factor Forever miniseries, which features her intended conclusions for the ongoing subplots, and surprisingly strong artwork by Dan Panosian. While the previous issue wasn’t quite Image Insane, we’ve reached that point now. The story does have a decent start, as some time is spent humanizing Hiro and filling in the details of the past of Opal’s parents, but within a few pages the random violence and explosions begin. To give you some idea of how rushed and chaotic the ending of this story is, the main villain dies off-panel after his daughter poisons his tea. Now, getting demure Shizu’ko to the point that she’s willing to betray her father and even murder him isn’t a bad direction to take the story in, but when the details are skimped over in the course of two panels, something’s clearly wrong. Portacio seems much more interested in drawing cyborg ninjas fighting each other, which means all of those pesky character subplots get pushed aside. Iceman choosing to fight Hiro without his powers is also derisorily stupid, but I guess it kind of works in an old school superheroic soap opera kind of way. 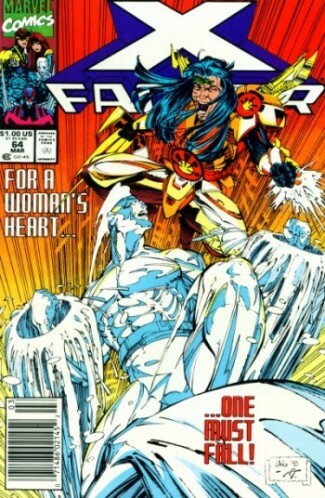 Opal and Iceman’s scenes aren’t so bad, actually, but the rest of the issue just feels rushed and disjointed. And Portacio is back to those ugly faces again, unfortunately.